Fike rupture discs are designed to provide instantaneous pressure relief at a predefined pressure and temperature. Installation is an important consideration that can affect the performance a ruptured disk. Installation instructions are included with all Fike ruptured disc shipments. These instructions should be followed carefully and completely. Remember to place the rupture disc assembly where it will have sufficient clearance to operate unhindered. The rupture disc assembly should be vented to a safe area where people and equipment are not at risk, as a system discharge can be hazardous or cause injury. Baffle plates used on the end of outlet piping will redirect but not eliminate potentially dangerous system discharge. The piping near the rupture disc assembly should be braced to absorb shock caused by the opening up a rupture disk. Fike provides a danger sign with all rupture disc shipments and it should be placed in a conspicuous location near the zone a potential danger. Keep the danger sign clean and unobstructed for ease of viewing. To install a new rupture disc remove the burst rupture disc assembly from its piping. Please use caution as a ruptured disk may have sharp edges. Remove pre-assembly screws or side clips and separate the holder components. If this is an existing installation, it is important at this point to do a visual inspection of the rupture disc holder. Inspect the holder seat area for nicks, scratches, corrosion, or deposits left by the process media. If necessary, hand polish the seat area with Scotch Bright, super fine steel wool, or a fine emery cloth. Before installing a new rupture disc into the rupture disc holder, clean the seat area with the solvent compatible with your media. To verify that the holder has not become deformed, place a straight edge on the flat flange mating surfaces of the base and hold-down. If the flat surfaces are not parallel with the straight edge, the holder should be replaced immediately. Visually inspect the rupture disc for shipping damage. Read the complete information contained on the rupture disc tag. Verify that the disk size, type, pressure, and temperature are correct for your system. After verifying that you have the correct rupture disc, carefully place reverse acting rupture discs into the hold-down of the holder. Or if the rupture disk is forward acting, carefully place the disc into the base the holder. Checked the rupture disc tag and make sure that the side labeled "vent side" faces downstream. Rupture disc tags with flow arrows must point in the same direction as the flow arrows on the ruptured disc holder. Carefully place the hold-down on top of the disc. Install the pre-assembly screws or side clips. Do not apply torque to the pre-assembly screws. Finger tight is sufficient. Check to be sure the gap between the base and the hold-down is equal all the way around the holder. If it is not, take the rupture disc holder apart and reassemble. After assembling the rupture disc and holder, you are ready to install the rupture disc assembly into your piping system. Place gaskets on the top and bottom of the rupture disc holder as needed. Gaskets that are subject to cold-flow are not recommended. Carefully place the rupture disc assembly between the piping flanges. Check to insure the holder flow arrows point downstream. Care should be taken not to damage the dome of the rupture disc, being particularly careful if it protrudes above the hold-down of the rupture disc holder. Check to see that all studs and nuts are the correct size. Lubricate the studs with the light, free running oil, such as 20 grade. Studs and nuts that show evidence of galling should not be used. Insert the studs into the flange and finger tighten. Check to see that the gap is still equal. If it is not, loosen the studs and the nuts and adjust flanges until the gap is once again equal. To determine the required torque, refer to the appropriate stud torque chart included in the written installation instructions. Find a nominal rupture disc size and ANSI rating of your flange. Follow the row across the column that contains your rupture disc type to determine what is required for your rupture disc in foot-pounds. Using a criss-cross pattern, apply torque in 25 percent increments. For example if the required torque is 100 foot-pounds, torque would be applied in 25 foot-pound increments using the criss-cross pattern. After each torque step, it is recommended that you checked the gap between the base and the hold-down to be sure that it is still equal. After the final torque step has been completed, make one revolution around the flange to be sure that each stud has received the correct amount of torque. 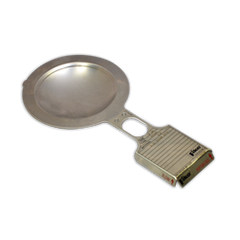 Fike rupture discs and holders come in many sizes and types. A common requirement of all designs is proper handling and installation. Please follow the instructions included in your Fike shipment to optimize performance and service life.